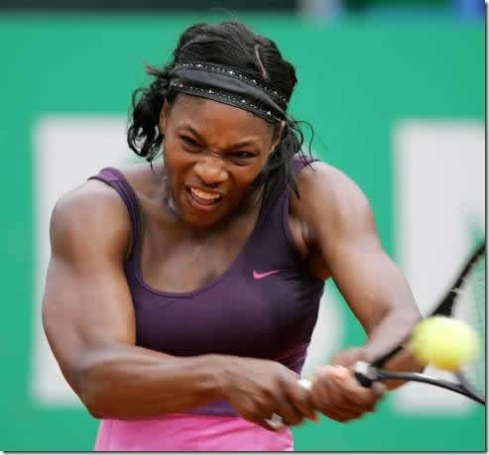 ROID RAGE — #1 Question In Women’s Tennis: Has Serena Williams Been Doping With Steroids? 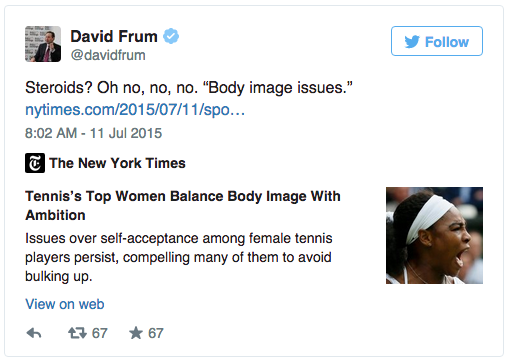 Conservative commentator David Frum recently upset the tennis blogosphere by strongly suggesting that Serena Williams has been doping with steroids. Why should such a suggestion be so politically incorrect in light of so much evidence that strongly suggests that Serena Williams may have been using steroids for several years now? 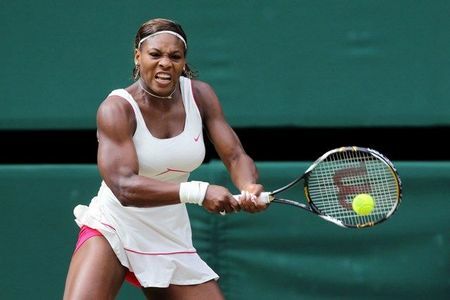 Her quite manly and extraordinarily muscular physique, her violent on-court behavior and her highly suspicious off-court reaction to drug testing are completely consistent with steroid doping. A major problem with the OC tests, in any case, is that they’re regarded by many as a joke. 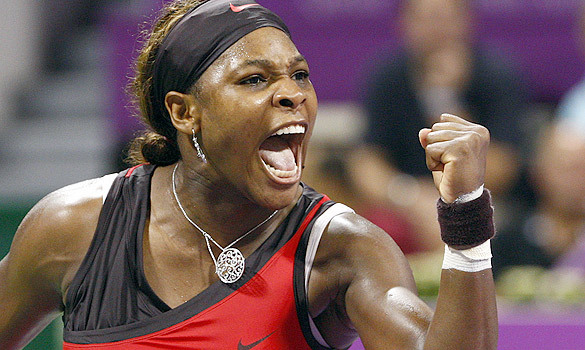 In 2011, Serena Williams locked herself in her Los Angeles home’s panic room when she thought an intruder was lurking outside. 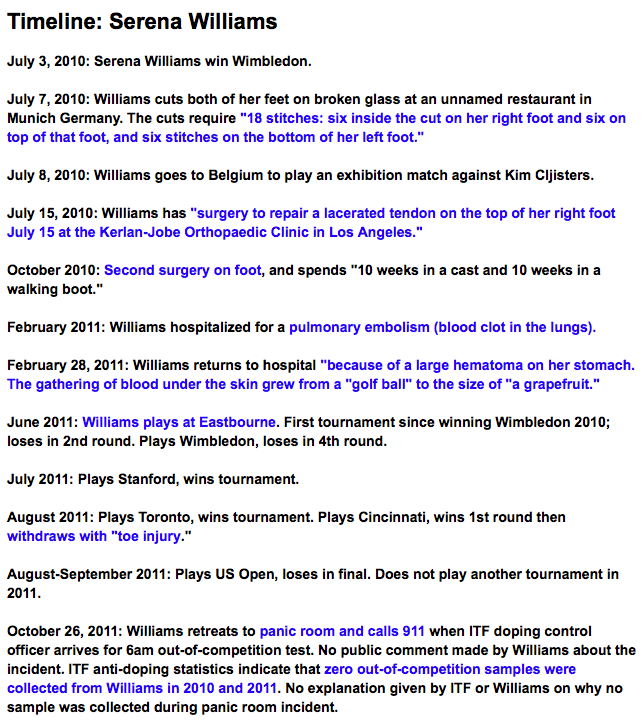 It was a drug tester; ITF data shows Williams didn’t take an OC test at all in 2010 or 2011. There is no question that both the tennis establishment and the mainstream media (MSM) have cut Serena a LOT of slack, particularly with regard to her shocking on-court temper tantrums. Smashing tennis rackets and threatening a linesman are just some of her more outrageous behavior. Each of the following 3 videos graphically portray these types of unacceptable conduct. After viewing these videos it is quite clear that there is something is very wrong with Serena Williams’ behavior on the tennis court. Whether it is steroid-induced is the real question however. 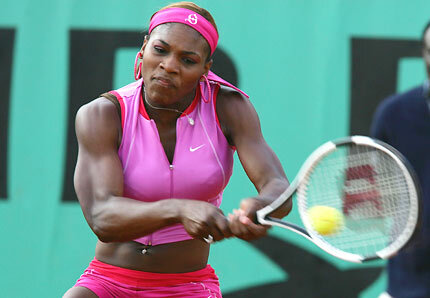 Steroid Use Produces Many Side Effects: Are Serena’s injuries and ailments the direct result of steroid doping? The following timeline of Serena’s tennis-related events has been documented by several MSM news reports. There appears to be a unique pattern of injuries, illness and strange behavior unlike that of any other female professional tennis player in ATP tour history. There is also her unparalleled and still unexplained on-court mystery ‘illness’ at Wimbledon in 2014. Her astonishing inability to even catch or bounce the tennis balls before her serves were a first in Grand Slam history. Even the commentators — and at least one had been around pro tennis for a long time — remarked that her odd performance was completely without precedent. What follows are 2 news reports of this incident, the second of which presents a video which well captures its uniqueness. The point is that prolonged steroid use has multiple consequences, both physical and psychological. Overuse of such body-altering and performance-enhancing drugs (PEDs) among female athletes is much less understood, however. Steroid doping may explain the frequent and unusual medical incidents that Serena has experienced over the past 5 years. Isn’t it time for the International Tennis Federation to pull it’s head out of the sand? Just as Lance Armstrong was able to prevent exposure of his team’s systematic doping over many years, winning the Tour de France year after year, many other top-tier bicyclists have admitted to doping with a variety of PEDs. U.S. Olympic sprinter Marion Jones admitted to steroid use for at least two years before the 2000 Olympic Games. How long before that period she used steroids may never be accurately known. Steroid-era baseball stars Mark McGuire, Barry Bonds, Roger Clemens, and Sammy Sosa have all been denied entry into the Baseball Hall of Fame because of their notorious steroid use. Admitted MLB steroid users Jose Canseco, Alex Rodriguez, Manny Ramirez and Rafael Palmeiro will likely suffer the same fate. Each of them rose to the very top of Major League Baseball, and then sailed along for years, even though many knew of the obvious and rampant steroid use. Serena Williams seems to have been ‘successful’ in a similar way, but has somehow eluded the type of scrutiny that all of the above ultimately received. She has consistently spoken out against any kind of drug testing regime, even though the integrity of the sport is now in serious jeopardy. Perhaps the time has now come for the MSM to blow the cover off of the serious doping problem in professional tennis. 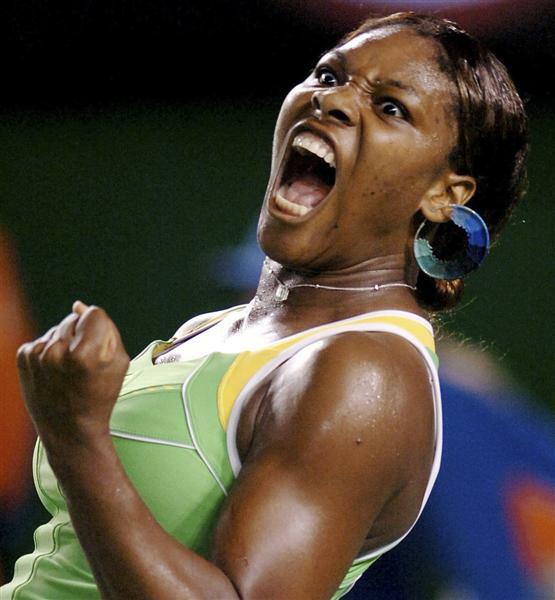 If for no other reason, the many FEMALE opponents of Serena Williams ought to be provided a level playing field. Certainly they should have no fear of facing an opponent who might explode with Roid Rage at any moment. 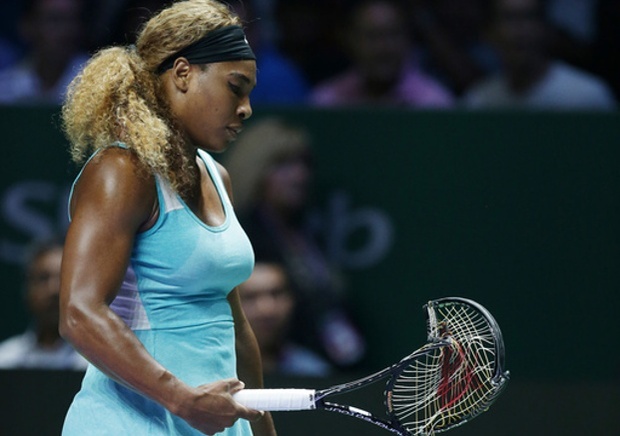 Serena Williams has smashed more tennis rackets than any other female tennis pro. Clearly, it’s high time for American tennis officials to begin policing their own with a much more substantive anti-doping program, as well as the strict enforcement of an effective “No Doping Policy”. The tennis star brought home her 21st major title after winning Wimbledon on Saturday, solidifying her status as one of the greatest athletes of all-time. But that didn’t stop Atlantic magazine editor and former George W. Bush speechwriter David Frum from accusing her of doing so unnaturally. 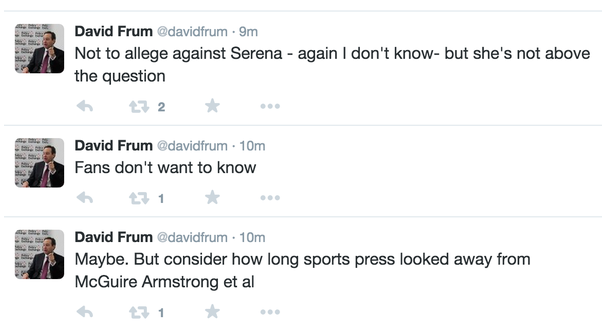 Frum posted other tweets, but he later deleted them, claiming they were part of a private message. He did say he stood by them despite choosing to delete them. The Doped Above and Beyond Belief Serena Williams! Williams, Preferential WTA draws She Gets, Her Doping. It is obvious that seeding procedure at all WTA events has been designed so that the strongest East European girls eliminate each other while Serena Williams is protected. East European Girls are lumped in the same portion of draw so doped Serena Williams meets the weakest (for her) players possible. This is a brazen example of discrimination against East European tennis females. The Americans and WTA use 7 years of detailed computer data to crunch the numbers and line up opponents for Serena Williams, opponents who absolutely do not have game against her or are injured. They even put in to the equation the type of court, the time of day, temperature, humidity, player injury history, how high over the net given player hits the ball, the service patterns, and much more. 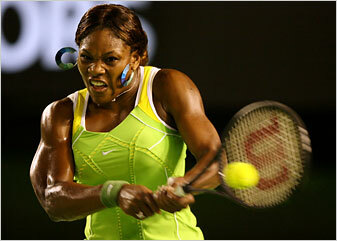 You will never see Williams meeting in early rounds players who could hurt her. Players like: Jankovic, Petrova, Lisicki, Kvitova, Stosur, Halep, etc. … they are all busy eliminating each other. They have a game against Serena Williams so they are forbidden to play her/him! And why any American Sportscaster does not notice that Serena Williams shaves her mustache and that her arms and legs are twice as thick, and twice as muscular, as the arms and legs of Djokovic and Federer… the top men players in the world! Doped, above and beyond belief, Serena Williams serves 127 miles per hour (you need very heavy arms to do that); on average, women tennis players are at 90 mph. And here are her arms a few years ago after the first doping sessions, today she is way bigger.